Four Day Planet is not fine literature – it’s not even among the better scientifiction that I’ve read (or listened to, in this case). The dialogue is stilted, the plot is okay as it goes – nothing ground breaking, but told competently – and the characters are pretty wooden. So why would I recommend it? Because it strikes me as a wonderful “gazetteer” for games like Traveler – a really well realized and interesting setting for science fiction games. The “four day planet” of the title is Fenris – inhabitable by humans, but only just. It has a four day year, spending half of it as a boiling hell hole and the other half as a frozen iceball. There is native life, mostly in the oceans, and humanity living in a large bunker-city. The main industry of the planet is the collection and sale of “tallow” – a waxy substance taken from massive sea creatures called “sea monsters”. The tallow is collected by monster hunters, guys who work on “boats” that act as both submarine and aircraft – in essence, futuristic whalers. What Piper lacks in storytelling or characterization, he makes up for in a fantastical-but-believable science fiction world and universe. If you’re a Traveler player or enjoy semi-realistic sci-fi, I suggest giving this one a listen or read. You can also find it on Project Gutenberg or buy a copy at Amazon. Oh, man. I love me some H. Beam Piper. Space Viking, Lord Kalvan of Otherwhen and the rest of the Paratime stories, even the Fuzzies. (I personally think Lucas owes the Piper estate a goodly sum for those little Ewok guys.) I don't know what it is about his stories but they are among my favorites despite the fact that Piper died in the '60s several years before I was born. Piper is pretty much required reading for Traveller IMO. Uller Uprising is probably my favorite, but Space Viking, The Cosmic Computer, and the short story collections Federation and Empire are also worthwhile (of his short stories, Omnilingual is especially good). 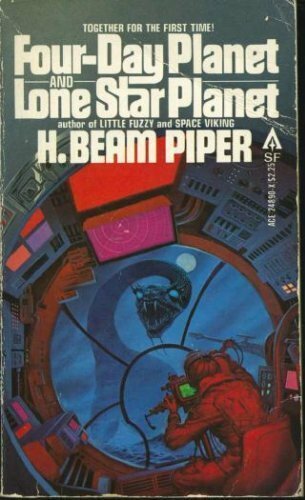 I'm not familiar with this novel, but I have read a number of H. Beam Piper's work and while he's no Clarke or Niven, I do consider him a good author. According to the H. Beam Piper site zarthani.net, “Four Day Planet” was published in 1961, putting it in the latter half of his body of works. I urge you to read some more of his novels before finalizing your opinion of his writing, many of his better known works were published after that one. Perhaps he was just not on his game with that novel, but I assure you that many of his other works are quite good. Piper's novels vary in quality, I wish the guy hadn't killed himself – I am pretty sure he would be remembered as one of the Golden Age greats had he created more. As it stands I personally think his stories compare to some of the earlier Heinlein works. Four Day Planet for example is a pretty good match, quality wise, to Farmer in the Sky. Space Viking is probably his best work – and the most Travelleresque, too, which is not surprising considering it is one of the works that the Traveller universe is based on. Besides that, I'd also recommend Cosmic computer and perhaps Lone Star Planet, Uller Uprising and Oomphel in the Sky. All of them are available on Librivox, read by the same guy (who does a very good job IMO).